Dempsey Dyer PVCu conservatories combine our range of windows and doors to provide you with a tailor-made design. We can manufacture and supply a range of different styles and sizes from standard 3x3 lean-to, to a fully bespoke stand-alone installation. Whatever your requirements, Dempsey can provide the solution, from unglazed frames only to a complete package including roof. Our conservatory roofs are made from an aluminium structure that includes external aluminium cappings and internal PVCU trims. We offer a complete CAD service for our PVC-U conservatories, with drawings specifically tailored to you. This process ensures that all parties involved with the project are clear as to what is to be manufactured. 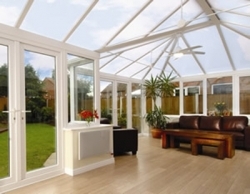 All DD conservatories are available in a variety of colours and woodgrain foils. Choose from our standard range or Deceunink's bespoke 'Deuctone' range. We also offer a choice of five different beads: Standard, contemporary, decorative, chamfered and the 2800 series decorative. Availability is dependable on type of profile used.